One of the biggest concerns to customers when buying used parts is the warranty. People want to know if the company is willing to stand behind the product. As a consumer, you may wish to know that Rectangle Auto Supply pre-tests all of its engines and warranties them for more than the industry standard. Warranties in the industry today are typically 30 days. 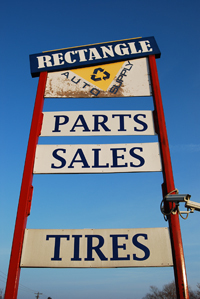 Rectangle Auto Supply's warranty is over 3 times the industry standard at 100 days ! Confidence in our product allows us to stand behind everything that we sell. With over 1 million parts in stock at all times, we should have the part that you need and the warranty to cover it too. Some of our rebuilding services cover items such as alternators, starters and even transmissions We Deliver Your Parts! As part of Rectangle Auto Supply's commitment to excellence in service, we offer a delivery service on all orders over $100.00 to St. Catharines and the immediate surrounding area. This is especially handy if you need an engine or transmission delivered and you do not have a pick up truck to get it there. Speak to Marcel, Dave or Scott to make Arrangements. Usually delivery arrangements can be made within 48 hours or order. Speak to your customer service rep for details. Speak to Marcel about having your order shipped the same day! Call your sales representative for details!